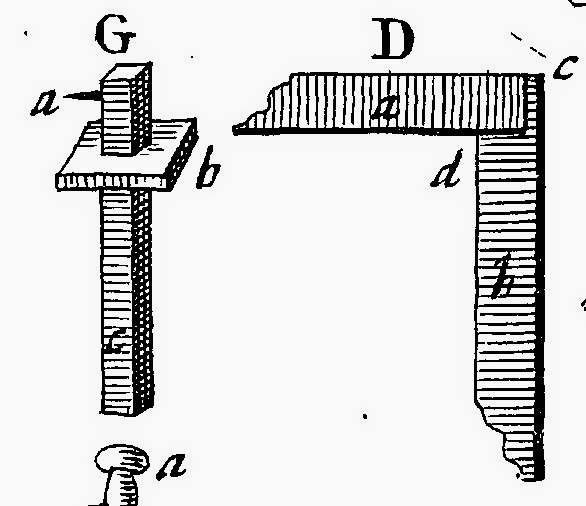 As a continuation of excerpts from Joseph Moxon's Mechanick Exercises let's take a look at his explanation of Plaining and Trying or rather what we usually refer to as jointing or squaring lumber. Moxon refers to wood in all instances as "stuff" therefore I have rather unscrupulously replaced all instances of the word stuff, save the tittle, with corresponding terms such as lumber, wood, board, material etc. You're welcome. We will take, for example, a piece of wood called a Quarter, which is commonly two inches thick, four inches broad, and seven foot long. To plane this square, lay one of its broad sides upon the bench, with one of its ends shoved pretty hard into the teeth of the Bench-hook, that it may lie the steddier. Then with the Fore Plane, as you were taught, plane off the roughness the Saw made at the Pit, and work that side of the Quarter as straight in its length and breadth as you can with the Fore Plane, which you may give a pretty good guess at, if the edge of the Iron have born all the way upon the work, yet you may try by taking up your Work, and applying one end of it to one Eye, whilst you wink with the other, and observe if any Hollow, or Dawks be in the length of it, if not, you may conclude it pretty true: For the Work thus held, the Eye will discern pretty nearly. Or, for more certainty, you may apply the edge of the two-foot Rule, or rather a Rule shot the full length of the Quarter to your Work, and if it agree all the way with the Rule, you may conclude it is straight in length. But if you find it not straight, you must still with the Fore-Plane work off those Risings that bear the edge of the Rule off any part of the board: Then try if the Breadth be pretty straight j if it be, (the Dawks the roughness the Fore-plane made excepted) the first office of the Fore-plane is performed: If it be not, you must straighten the Breadth as you did the Length. But tho' this Quarter be thus plained straight in length and breadth, yet because the Iron of the Fore-plane for its first working the lumber is set rank, and therefore makes great Dawks in the wood, you must set the Iron of your Fore-plane finer, as you were taught and with it then work down even almost to the bottom of those Dawks: then try it again, as before, and if you find it try all the way, you may, with the Jointer, or smoothing-plane, but rather with the Jointer, go over it again, to work out the irregularities of the fine Fore plane: For the Iron of the Fore-plane being ground to a Rising in the middle, as has been shewed, though it be very fine set, will yet leave some Dawks in the surface for the Jointer, or Smoothing-plane, to work out. Thus the first side of the Quarter will be finished. So is the second side also finished. side of your Stuffs so as the Tooth may reach athwart the breadth of the stuff upon the first slide, and keeping the Oval close against the second side, press the Tooth so hard down, that by drawing the Gage in this posture all along the length of the Quarter, the Tooth may strike a Line. In like manner upon the side opposite to the first* viz. * the fourth side, Gage another line opposite to the first gaged Line, and work your Stuff down to those two gated Lines on the third side, either with Plaining along, or with Hewing, and afterwards Plaining as you were taught to work the second side. 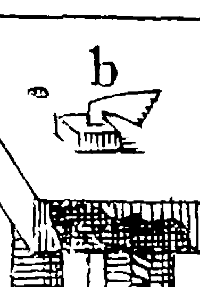 To work the fourth side, set the Tooth of the Gage to its exact distance from the Oval two Inches wanting so much as you think the Stuff diminished in working, and apply the flat of the Oval to each side of the first fide, and Gage as before two Lines, one on the second, the other on the third wrought side. Work your Stuff then down on the fourth side to those two Gage lines either with Plaining alone, or with Hewing, and afterwards Planning, as you were taught to work the second side. Woo… tired of reading yet? Moxon doesn’t mention proper use of the planes or rather any specific techniques – he covers that on a couple pounds of paper in an earlier section. To break this down, the nut-shell version if you will goes like this. Secure the board flat on your bench by jamming into the bench hook. The addition of a stop for the back of the board is also quite helpful. Use a fore plane to take down the high spots and traverse the boards edge to edge (across the width) and at an angle askew to the grain. Follow up with a jointer plane to remove the peaks between the dawks or trenches left by the fore plane’s radiused iron. Sight down the board to check for flatness or use a straight edge side to side, corner to corner to check. Moxon does not mention the use of winding stick but I point out that they are quite helpful at this point. Plane down any high spots left until the surface of the board is flat and true down the the depth of the lower area of the board. You have now successfully tried or joint one face of the board – congradulations! Place the board in a vise or other device to then joint the edge of the board square to the flattened face. – Again we are trying the board. This edge should be 90 degrees to the flattened face by use of a jointing plane. Moxon does point out that a fore plane may be used to start and even there is a great bit of matial to use that one should use a hatchet! He further cautions to be careful with the hatchet as to not remove too much material and spoil your stuff by making it unsizable. Finish up with a jointer plane and use a square down the length of the board to ensure it is tried to the previously jointed face. Congratulations again, you have now jointed two faces of the board. Here is where I differ from Moxon. Moxon would have us use a gauge to, striking from the jointed face along all four edges of the board to give us the defining line of an opposite coplanar surface. I typically joint my opposing edge prior to jointing the last face side of the board simply because it makes the line struck easier to see. There is one disctinct disadvantage to this and that is that we may but not always loose a bit of width of the board or be forced to plane the board thinner than desired due to blowout of the edges as we use the fore plane aggressively to joint the last face. With care and practice this can be mainly avoided. In any case the method for establishing a parallel edge for the board is to use either a large marking gauge or a panel marking gauge to strike a line from the jointed edge. I use a panel gauge and strike deeply. In the event that I have a lot of material to use I do not hesitate to use a hatchet or broad hatchet to get close to the line. Do not be afraid of hatchet work – your furniture will be a hatchet job you can be proud of. With a bit of practice and the right hatchet rough jointing boards is incredible easy and quick. It is a matter of selecting the right tool for the job to keep us efficient. For jointing the last face of the board you will repeat the process as with the first face however now you are working to a line from the marking gauge. Set your gauge to the just less than the thinnest point of the board or to a predetermined thickness and mark all four edges. Next plane down to this with your fore plane being cautious not to remove material past the line. Remember those dawks need to be above the line so that the work of the jointer and smoother result in a level at the line. If you have trouble with this last face and are prone to planning past the line there is a little trick you can employ to help. Using a fillister plane set about 1/2'’ wide run a rabbet around all four edge down to your line. This will give you a physical landmark to which to work as well as prevent your edges from blowing out while using the fore plane. If possible, try to remove an even amount of material from each side of your board. Also remember that hand tooling a jointed board is no different than using power tool – for fine work you should joint your lumber oversized and them allow it to acclimate and stresses to come to a new equilibrium prior to a final jointing. This means allowing lumber that is already dry to sit overnight, at least, in the shop prior to continuing work with it. This is most important for hard wood with soft woods generally being more stable. Also a trick my friend and fellow furniture builder, Jon Brinkerhoff, shared with me is to beat large slabs being jointed with a rubber mallet to quicken the balance of tensions – you can sometimes watch them twist and cup while wailing on them with the mallet! Other considerations for hand tool lumber preparation is to keep in mind the end use of the board. If the board will have tenons on one or both ends there is no need to shoot the ends square or give them much regard when sawing. The end of the tenons need not be perfectly straight or square and energy spent on this is energy wasted. Mark the shoulders of your tenons square and fret not about the rest. Another thing to consider is that in many instances you need NOT joint the second face of a board. Will anyone see the back side of your table apron? Again, energy and time wasted. Craftsmen of two-hundred years ago realized this as is evidenced by examples of fine work with unjointed backs of boards on the bottoms and backs of drawers, the backs of case work, etc. If nothing else this lends to the authenticity of what we do as Traditional Woodworkers. Nice idea with the rabbet planing to the line when thicknessing! With the depth stop and all it'd save a lot of time checking the gauge line. Remember you are not using a depth stop with the rabbet plane because you need to plane down to the line regardless of the depth. ie a depth stop of the plane will ride the irregularities of the board when what you want is to establish a lip all the way around that is coplaner to the flattened side. Yes, I realized that after thinking about it a bit more... no use to end up with a slightly thinner but otherwise still non-coplaner board. I also had some luck just using teh scrub plane around the perimeter of a board at my gauge line, but there's more risk of tear out with that.